I’ve been thinking about writing a lot lately, but simply couldn’t find the time. Last week the guys picked me up at four in the morning, and with a fully laden car we headed south to France. For once it was a very uneventful trip, and we arrived somewhere in the afternoon. I started feeling sick that evening, and was useless for the entire day after. I still feel a bit weak every now and then, but at least it mostly passed before going to Switzerland. Rogier however became sick the day we arrived in Switzerland, so he actually did lose a day of snow. Now we’re just waiting for Fabian to get sick as well, but so far he has dodged the bullet. The guys both use Sony A7 mirrorless cameras. Which are, admittedly, lighter, smaller, and more high-end than my Nikon D3300. Yet the rivalry hardly ever fades when out on trips, or just talking equipment. 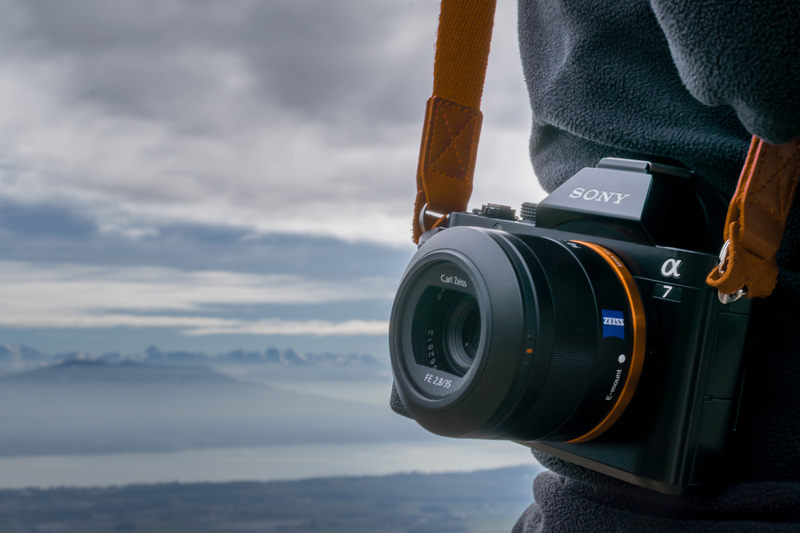 It is clear as day that Sony’s A7 is much better than the Nikon D3300, simply because they are made for different photographers (pro vs. amateur). But when it comes to upgrading my main body, I will still stick with the big Nikon DSLR’s. First because I like the D3300, and what I can do with it, so why change? Some other things I take into consideration are the fact that mirrorless uses a lot more energy, with the liveview always on, and I just don’t like the way it fits in my hands. At least with a DSLR I can grab a firm hold. Let the kids run around with toys. Another thing in which I differ from the guys this trip, is the lack of a snowboard. I’m not the athletic type of person, and I rather go walking with snowshoes and my camera. Or I find myself laying down in the snow next to the skipiste, taking pictures of the guys blasting past. Today the guys went snowboarding all day, and I drove down the mountain to visit my grandparents. Not before picking up my grandfathers favourite pastry of course. After lunch I drove to the local airfield, hoping to spot some private jets in the snow, but sadly the airport was abandoned. Except for some cars drifting in the distance, next to the runway. I got back in the car and drove around, only to stumble upon a Volvo racing experience, where people were drifting and racing the latest models in the snow and ice. I asked if I could take some pictures, which was fine as long as I kept a safe distance from the track. I wished I had worn my winter clothes so I could lay down in the snow, but I still managed 316 shot in about 20 minutes. Burst mode will do that to your memory card. I’ll spend the rest of today sifting through that stack and editing the ones I like, then I’ll send them to the guy from Volvo who was there and gave me his card. This past week I’ve felt less reserved to ask strangers if I can take their picture. I read an article about the subject, and they had a tip that works really well. It basically said your goal shouldn’t be a picture of someone, but it should be getting to know someone. People don’t want to be an object, they want you to acknowledge them as a person first. It does make it easy to take someones picture knowing it’s alright, and I always try to offer them the pictures I’ve taken. And if someone says no, then that’s fine too, there are enough other photographs to be taken out there. Of course this isn’t the only reason I feel less reserved, theory is just the start. So when I saw a girl practising her figure skating routine, I decided to just ask her if she’d mind me taking some pictures. Thankfully she didn’t. Like my uncle said, people love what they do, and for someone else to show interest in that, is flattering to them. I emailed her the pictures today, and I hope she likes them. I asked her if she would mind me using them on the blog, so if she doesn’t, I’ll show you some next time. Tomorrow will be stormy, according to the weather forecasts, so I’m not yet sure what we’ll be up to. Perhaps just editing photos all day will suffice, but I might get an itchy trigger finger and set out for some more pictures anyway. I’m not sure what Rogier and Fabian have in mind, and walking in the deep soft snow is tiring to say the least, but according to Fabian, it should pay off.